SEATTLE — As the first discoveries from a new NASA exoplanet mission start rolling in, project officials are planning for the first in what they hope to be a series of extended missions for the spacecraft. 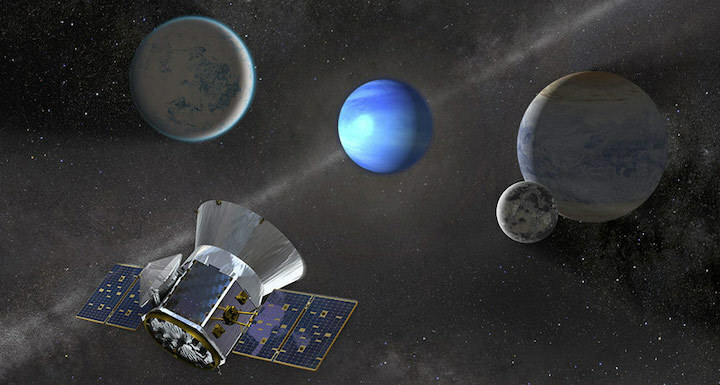 During a briefing at the 233rd meeting of the American Astronomical Society here Jan. 7, scientists working on the Transiting Exoplanet Survey Satellite (TESS) mission announced that they have already discovered three planets, each smaller than Neptune, orbiting stars within 100 light-years of the solar system. The most recent of the three planets, HD 21749b, orbits a star 53-light years away with an estimated mass 23 times that of Earth. The star it orbits may have a second planet, about the size of the Earth, orbiting closer in, said Chelsea Huang of the Massachusetts Institute of Technology (MIT) at the briefing. The discoveries come from data from the first few months of TESS operations, covering four of a planned 26 sectors of the sky that the spacecraft will observe over the next two years. The spacecraft, launched in April 2018 on a SpaceX Falcon 9, started science observations in July. “We’ve made great progress using three months of data,” said Huang. Scientists involved with TESS said the early results show the potential of the spacecraft to help discover many more small exoplanets around nearby, bright stars, excellent candidates for follow-up observations by other observatories, including the James Webb Space Telescope. 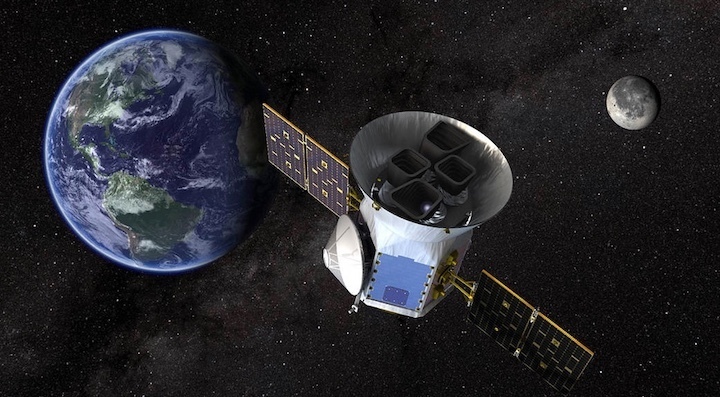 “The very best targets that Webb will be able to spend time studying in detail spectroscopically are, of necessity, going to be the bright targets that TESS will actually find,” said George Ricker, principal investigator for TESS at MIT, at the briefing. Ricker and others involved with the mission hope that the exoplanet discoveries and other astrophysical phenomena, such as supernova explosions, detected in images from the spacecraft will continue for many years to come. For now, TESS is about one-fourth the way through a two-year primary mission. However, planning is already underway for one extended mission, Ricker said. That extended mission, lasting a little more than two years from mid-2020 to late 2022, would revisit some areas of the sky observed in the prime mission as well as fill in some gaps not observed. The proposal for that extended mission, which will be part of the overall senior review of astrophysics missions, is due to NASA Feb. 1. Ricker said that the ongoing partial government shutdown, which affects NASA, could push back that schedule. Ricker is hopeful that the extended mission is the first of many for TESS. The spacecraft is in excellent condition, with camera performance and stability far better than anticipated. The spacecraft’s reaction wheels — which caused problems for another exoplanet mission, Kepler — are based on designs with commercial satellite heritage that should last for decades, and the spacecraft’s reserves of hydrazine fuel, used at a rate of one gram a week for momentum management, can last for far longer. At the briefing, Ricker showed a chart of extended missions going out through the 2020s. Those additional extended missions, he said, could support a wide range of other spacecraft and groundbased observatories that can study exoplanets in further detail, such as the Wide-Field Infrared Survey Telescope (WFIRST) and ESA’s Planetary Transits and Oscillations or stars, or PLATO, spacecraft. Measurements indicate a dense, gaseous, “sub-Neptune” world, three times the size of Earth. Since it launched in April 2018, TESS, an MIT-led mission, has been monitoring the sky, sector by sector, for momentary dips in the light of about 200,000 nearby stars. Such dips likely represent a planet passing in front of that star. TESS is a NASA Astrophysics Explorer mission led and operated by MIT in Cambridge, Massachusetts, and managed by Goddard. Additional partners include Northrop Grumman, based in Falls Church, Virginia; NASA’s Ames Research Center in California’s Silicon Valley; the Harvard-Smithsonian Center for Astrophysics in Cambridge, Massachusetts; MIT Lincoln Laboratory; and the Space Telescope Science Institute in Baltimore. More than a dozen universities, research institutes, and observatories worldwide are participants in the mission. SEATTLE — The next generation exoplanet hunter is coming into its own. NASA’s Transiting Exoplanet Survey Satellite, or TESS, has already found eight confirmed planets in its first four months of observing — and some are unlike anything astronomers have seen before. “The torrent of data is starting to flow already,” TESS principal investigator George Ricker of MIT said January 7 in a news conference at a meeting of the American Astronomical Society. TESS launched in April and began science observations in July (SN: 5/12/18, p. 7). It was designed to be a follow-up to the prolific Kepler space telescope, which went dark in October after almost a decade of observing (SN Online: 10/30/18). Like Kepler, TESS searches for planets by watching for dips in starlight as planets cross, or transit, in front of their stars. Unlike Kepler, which stared unblinkingly at a single patch of sky for years, TESS scans a new segment of sky every month. Over two years, TESS will cover the entire 360 degrees of sky visible from Earth’s orbit. In the first four segments, TESS has already spotted eight confirmed planets and more than 320 unconfirmed candidates, said Xu Chelsea Huang of MIT. And several of them are downright strange. WATER WORLD The exoplanet Pi Mensae c, as seen in this artist’s illustration, has the same density as pure water. Take the third-found planet, HD 21749b. Only 52 light-years away, it has the lowest temperature known for a planet orbiting a bright, nearby star, astronomers reported at the meeting and in a paper posted at arXiv.org on January 1. That makes it a great candidate for follow-up observations with future telescopes like the James Webb Space Telescope, scheduled to launch in 2021. Webb will use starlight filtering through the atmospheres of planets like this one to measure those atmospheres’ properties and search for signs of life (SN: 4/30/16, p. 32). “If we want to study atmospheres of cool planets, this is the one to start with,” Huang said. “Cool” is a relative term. This particular planet is still probably too hot and gassy to host life. Its orbit takes 36 Earth days, the longest known orbital period for planets transiting bright stars within 100 light-years of the sun. That leaves it at a distance from the star that should heat the planet’s surface to about 150° Celsius, too hot for liquid water. And at 2.84 times Earth’s size and 23.2 times Earth’s mass, its density suggests it must have a thick atmosphere, unlike Earth’s life-friendly one. But it’s still worth checking out, says astronomer Diana Dragomir of MIT, a member of the TESS team. Despite its heat, this planet is “tepid” compared with most of the scorched worlds whose atmospheres astronomers can probe right now, she says, so closer to an Earthlike system. Smaller, cooler, more Earthlike worlds are few and far between, and may not orbit such bright stars. LAVA LAND The exoplanet LHS 3844b, illustrated, is slightly bigger than Earth, and orbits its star every 11 hours. It’s probably a lava world, scientists think. The other planets in TESS’s first haul are equally exotic. TESS’s first find, Pi Mensae c, was reported in September (SN Online: 9/18/18). The planet orbits its star every 6.27 days, and is about 2.14 times Earth’s size and 4.8 times Earth’s mass, giving it a density similar to pure water. The weirdest thing about that super-Earth is the company it keeps, Huang said. Previous observations showed that the star Pi Mensae also has a planet 10 times the mass of Jupiter that orbits every 5.7 years. That planet, Pi Mensae b, revolves on a wildly eccentric orbit, swinging between the distance of Earth and the distance of Jupiter from its star. “This is the most extreme system we know of that has this type of architecture,” Huang said. TESS has completed about one-twelfth of its first sky survey, but Ricker is already writing proposals to extend its initial two-year mission. TESS’s orbit is held stable by the moon’s gravity, so it doesn’t need to spend any fuel to stay put. The fuel on board, used to change the direction the telescope points, is enough to last for 300 years.